Krka National Park is a Must-See if You’re in Croatia! Visiting Krka National Park is often on the bucket list of those visiting Croatia. The park has some of the best kept and well-preserved ecosystems in the country. We can absolutely see why so many flock there each season to discover the park’s beauty! It was on our list of top things to do in Croatia the entire time and we only got to visit in the final week of our time in Croatia. We’re so glad we made the journey. There are a few things we wish we had known beforehand. These include details about the journey there, the entrance fees, the towns around the park, and the buses! That’s why we’ve written this guide on our experiences and to help you plan the perfect day in Krka! If you’re travelling from Split to Krka National Park, this post is definitely for you as we did that exact journey! We’ll also cover the entrances, the entrance fees, the hotels nearby to Krka, and a few tours that you might consider hopping on to make your day easier! Oh, and we’ll share with you a few of the photos from our adventure and one really cool video – just below! Ready to go explore stunning waterfalls and have a day spent in nature? Let’s go to Krka! 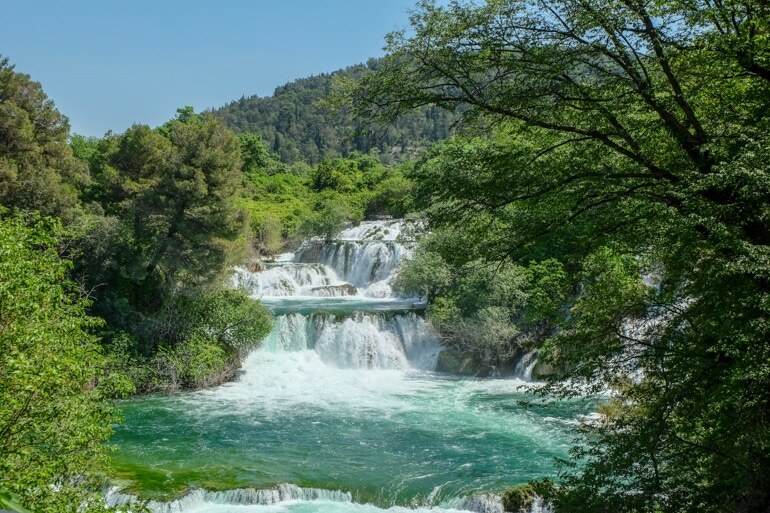 Check out this video snippet to get a feel for how beautiful the Krka National Park is! Warning: There are so many waterfalls in this national park! You can watch the whole video on our YouTube Channel here. 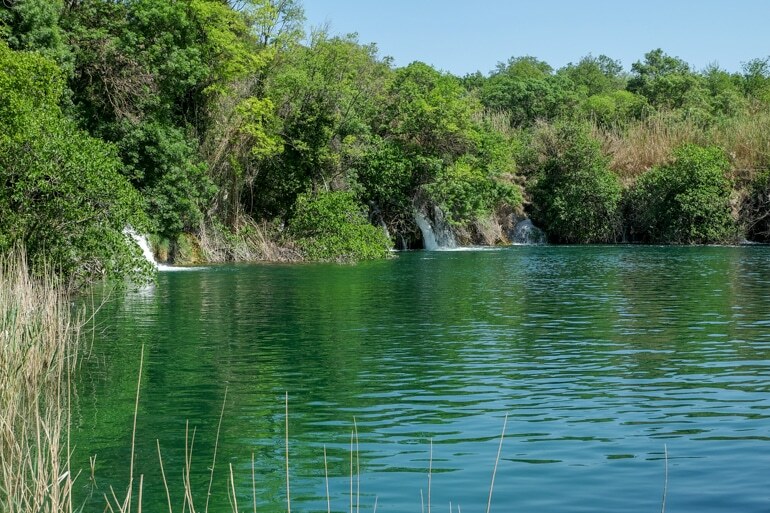 Where is Krka National Park? Here’s Eric looking for Krka National Park. Oh wait, there it is! The national park is technically located in Šibenik-Knin County. The park itself is based on the ecosystems of two major rivers in Croatia: Krka River and the Čikola River. From Zagreb, Krka is about 4 hours driving so you could theoretically visit it on a day trip from Zagreb. That said, the park’s south entrances are about an hour driving by car from Split but longer by connecting buses, which we will get to below. From Dubrovnik, it’s not unheard of to do a day trip to Krka. The trip up would take about 3.5 hours depending on which highways you take. If you’re coming to Krka from Zadar, the trip is going to take about an hour. It’s surprisingly close to get to from the Zadar coast! Read Next – Our Full Day Itinerary for Croatia Island Hopping to 5 Islands! 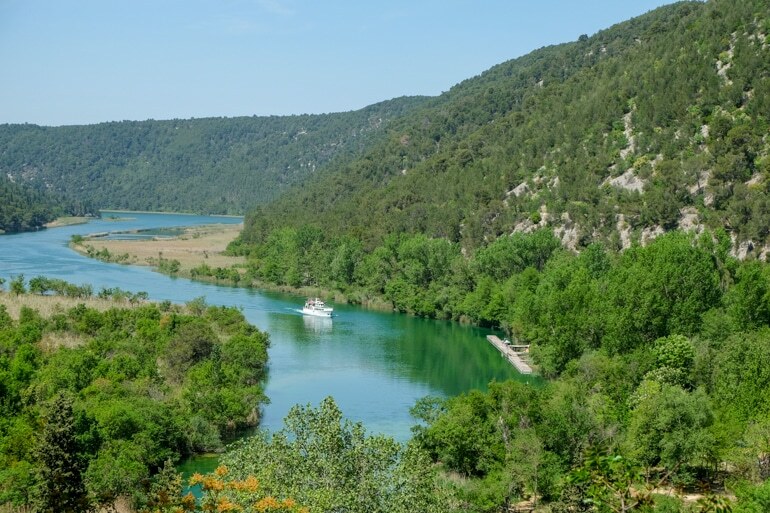 There are a few different options for heading to Krka. You could rent a car and drive yourself there or you could take a “special” bus that takes you straight to Skradin. There are routes between Zagreb and Split that go direct and stop in Skradin. You can check getbybus.com to get more information. Alternatively, you could use public transport and piece together a trip if you had to. This second option is what we ended up doing. The details of our trip are below. Skradinski buk is stunning at every level as you hike along. You could also hop on an organized tour to get to Krka for the day. Looking back, we might have done this option because in the end it is not more expensive than doing it yourself and you don’t have the hassle of changing buses. As we did the journey from Split, we can give you a few more details in the next section on tours to Krka from different places nearby. Also, you may be looking for other day trips from Split – so check out this post on those! As we have said above, you can use one of the buses that stop right in Skradin. These buses are run by BusCroatia. There is a bus at 8:00 am and another at 12:30 pm. In fact, as the season has gone on since we went there, there are even more times available now. The 10:15 am bus wasn’t an option when we went in the middle of April. In any case, this type of route was our original plan. Since we lived outside of Split we didn’t buy the tickets in advance. We thought it would be fine to book them the morning of since it was not the busy season yet (mid-April). When we arrived at the bus station, we were told that both the 8 am and the 12:30 pm bus were full. So, if you want to use these buses (which price-wise are a good deal as far as we can tell), make sure to book a few days in advance so you can secure a spot. We imagine that these buses get even more popular during the summer months. Alternatively, you could also use local buses. This is what we did. We took a bus from Split to Šibenik at 8 am which was supposed to take slightly more than an hour, but with construction and traffic took closer to 2.5 hours. We arrived in Šibenik around 10:45 am. From there, we took a bus to Skradin. As it is quite a small city, there are daily buses but they don’t run on a very frequent schedule. There is a bus at 11: 15 am which is the one we took. To be honest, this is the only one that makes sense for travellers who want to make Krka a day trip only. There might be buses very early in the morning or late in the afternoon but these are not convenient if you don’t start/end your journey in Šibenik or stay in Skradin overnight. In the end, the bus ride is definitely worth it! In the other direction, there are buses from Skradin to Šibenik at 2:00 pm and 5:00 pm in the afternoon (we took the bus at 5:00 pm). From Šibenik, we then took a bus back towards Split at 5:30 pm. We luckily caught the 5:30 bus because it was delayed – if you can’t make this one, then there is another bus at 6:15 pm. It was quite easy to buy the bus tickets at the station in Šibenik (both to Skradin, and return to Split). The ladies behind the counter were helpful and able to communicate in English quite well. Just remember to bring cash or a card to take out money as you can’t pay with credit card. We took lots of photos in the park. As we have said above, looking back a tour might not have been a bad idea. Then we wouldn’t have had to deal with different buses and time schedules, etc. The price for a tour would also not have been more expensive. The price for the public transport ended up not being super cheap and with a tour you sometimes get a discount for the entrance to the park (depending on how many people are part of the group). This Krka waterfall tour will take you from Split or Trogir, depending on which location you specify and book. This one is a top-rated tour on Get Your Guide. You can get more information here. This tour leaves from Split only and that may work better for you if you’re staying right in Split. 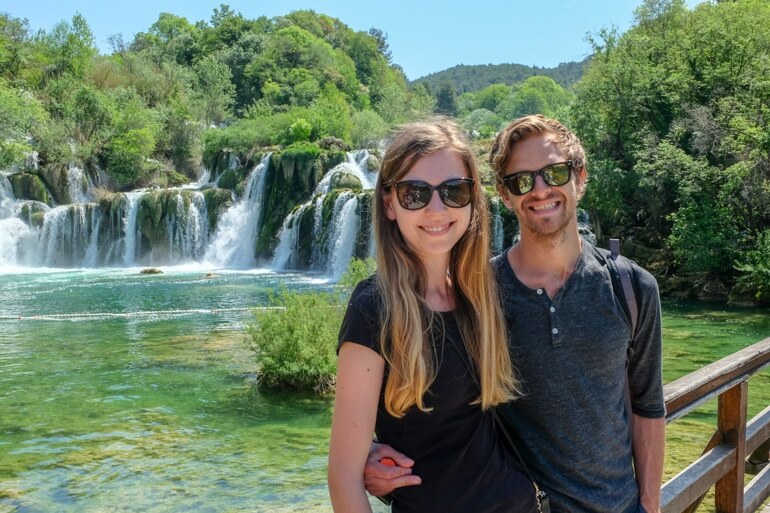 Check out this tour to Krka National Park from Split. 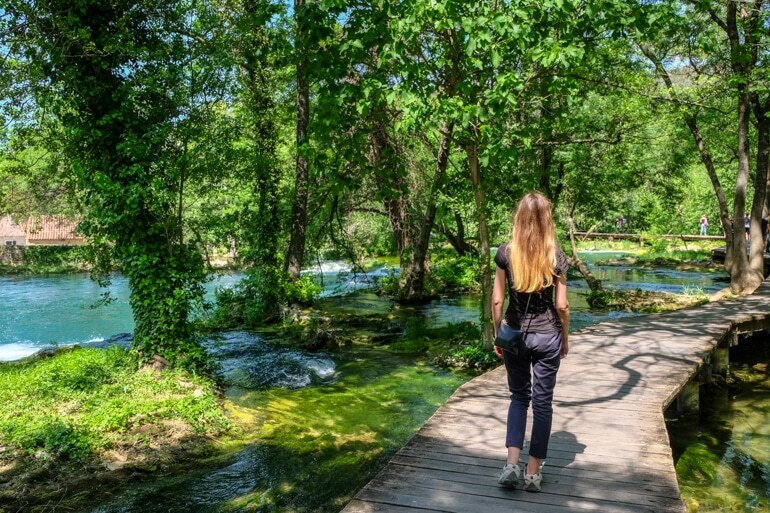 If you happened to be in Zadar, you might also be interested in visiting Krka so we included this top-rated tour to Krka from Zadar so you can also see what’s available! You should know that there are actually five different entrances to Krka National Park. If you are taking a bus or arriving by car from Split, Dubrovnik, or Zadar, the most relevant for you would be Lozovac and Skradin. Lozovac is great if you arrive by car. There is a big parking lot with free parking (as far as we know) available. From there you can either walk into the park (it’s really not far) or take a free shuttle bus if you can’t or don’t want to walk. This entrance is also closer to the waterfall Skradinski buk which everyone wants to see so do factor that in! The ferry bringing passengers to the Skradin entrance. The ferry ride is included in your entrance ticket. Skradin is for those that arrive by bus (direct buses or buses via Šibenik). From there you can either walk approx. 3.5 km or take a shuttle boat which is included in your ticket price. We opted for the boat, as our feet were still hurting from a hike we had done the day prior and we didn’t want to miss the opportunity of seeing the scenery from the water. We would recommend you take the boat at least one way. The boat leaves every full hour from Skradin (we took the boat at 12:00 pm) and the ride takes slightly longer than 20 minutes. From the park, the boats leave at the half hour (we took the boat back at 3:30 pm). Admittedly, this is not an easy answer as the entrance fee changes with the season. It also depends on whether you are travelling as part of a big group or not. You can check the prices here at the official Krka Website. You should also note that it is a lot cheaper to visit during the winter months. However, boat connections in the park to other sights don’t run regularly (if at all) so be sure to read the fine print as well! This isn’t where you swim but wow was the water beautiful. Eric was honestly so excited to go swimming in the water close to the waterfalls. However, since it was still not the right season yet and there was construction on the main pedestrian bridge, swimming was prohibited. That was what the park staff and a few signs told us. The signs stated that swimming was not allowed from December to the end of May. Some people were in the water and nobody seemed to say anything. However, overall people couldn’t really swim and enjoy the water as much as you can during the “official swimming season”. When you are allowed to swim, one of the official locations is right by the Skradinski buk waterfalls. 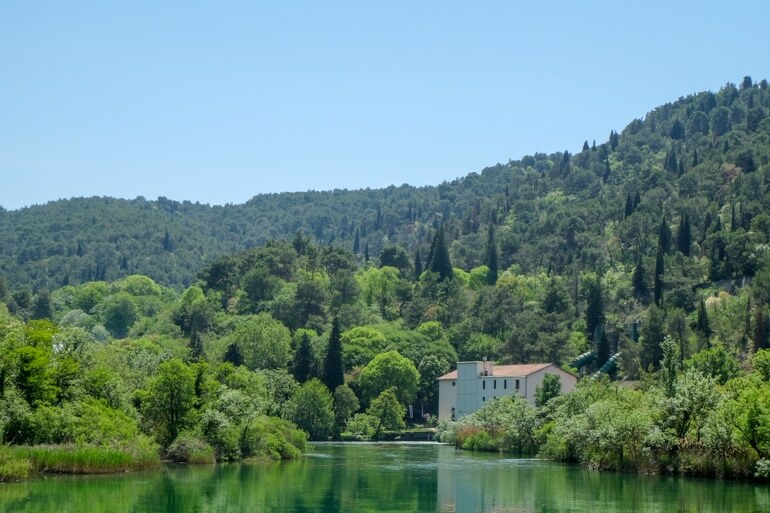 The grounds of Krka are steeped in history and natural beauty. There are no official Krka National Park hotels in the actual park. If you wanted to stay close you’d be looking at staying in the city of Skradin where the ferry starts/stops. There are lots of other campgrounds or apartments for rent at the Lozovac entrance as well. If you want to stay in Skradin and explore the town while being very close to the park entrance and ferry boat, check out the Villa Barbara for that perfect Croatia stay. 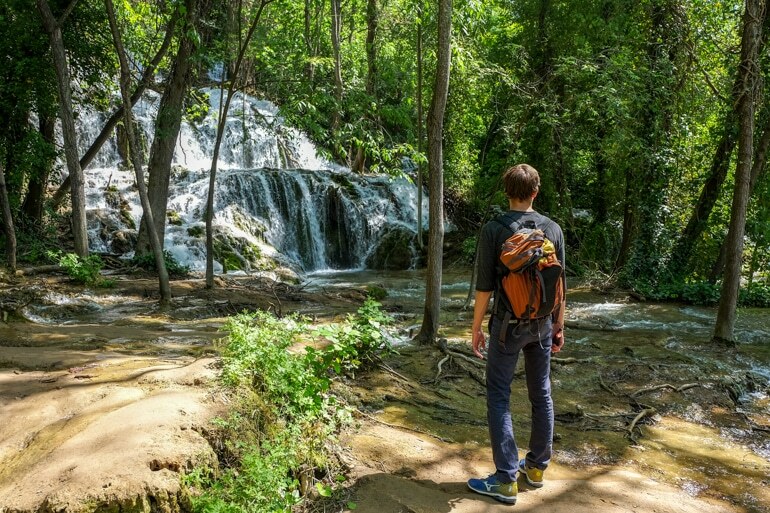 If you wanted to stay closer to Lozovac (and thus closer to the actual Skradinski buk waterfalls) then booking a stay at the Hotel Vrata Krke might be just what you’re looking for! And there you have it – a few of the important details about heading to Krka National Park. We honestly had a great time. However, looking back there’s a good chance we would have rented a car or booked a tour/private transport to bring us there and back. The numerous bus changes were doable but a bit of a hassle to the day. 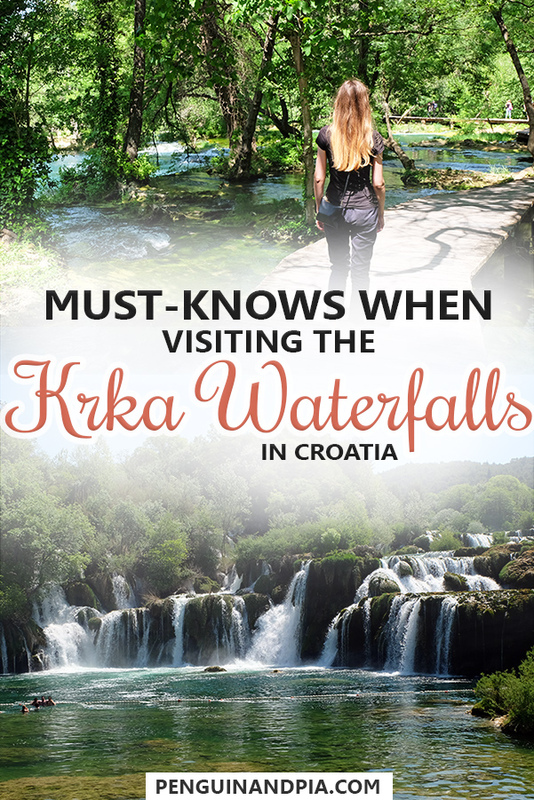 Since writing this post, we’ve actually created numerous itineraries for the perfect Croatia road trip (that include Krka). We’d recommend an adventure to the park if you’re able to make the trip! Let us know – we’d to love to hear about your adventures!